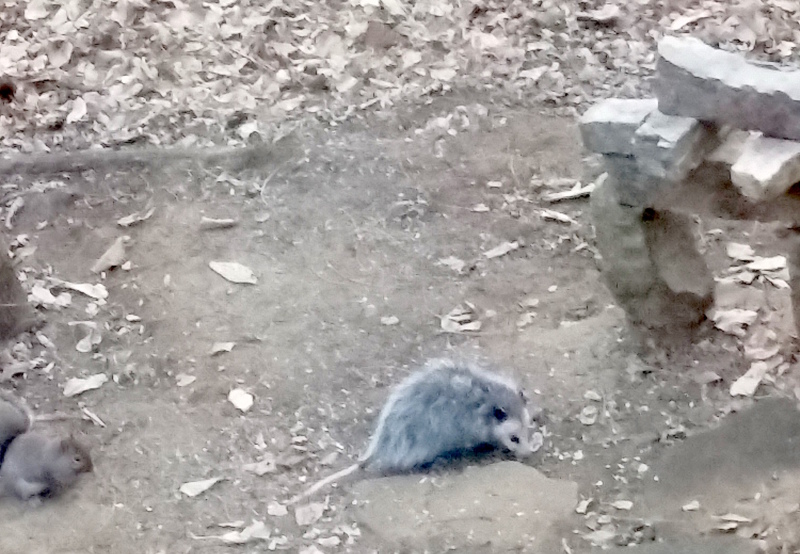 We have a small opossum that hangs around under our feeders. It shows up most days in the mid-afternoon, to graze on seeds and bits left by the birds and squirrels. Cute with its fur sticking out wildly all over, it’s not very big. Based on the one-pound grey squirrel on the left of the photo, I guesstimate it’s only three or four pounds. A “typical” opossum is about the size of a large house cat, and weighs in at 10 to 13 pounds. The title calls it a “possum,” but that is actually a different animal native to Australia and New Guinea. In North America, the animal is an “opossum.” Both are marsupials. With its prehensile tail and opposable thumbs, the opossum is an excellent climber. Besides the seeds my opossum enjoys, they are foragers and will eat carrion, rodents, insects, frogs, and plants including fruits and grains. As they are nocturnal, usually they are out at night. However, in the winter sometimes they change their patterns to take advantage of warmer temperatures during the day. If you’re hungry, you could try this recipe for roast opossum. “The opossum is a very fat animal with a peculiarly flavored meat.” The linked recipe also includes stuffing. 3. It is dressed much as one would dress a suckling pig, removing the entrails, and if desired, the head and tail. 4. After it is dressed, wash thoroughly inside and out with hot water. 5. Cover with cold water to which has been added 1 cup of salt. 6. Allow to stand overnight. In morning, drain off the salted water and rinse well with clear water. 7. Stuff opossum with opossum stuffing … ; sew opening or fasten with skewers. 8. Place in roaster, add 2 tablespoons water and roast in moderate oven (350°F) until tender and richly browned, about one and one half hours. 9. Baste every 15 minutes with drippings. 10. Remove skewers or stitches, and place on heated platter. 11. Skim fat from gravy remaining in pan. Okay, and this was too funny and too weird to leave out. Listen to Cy Scarborough and the Bar D Wranglers at the Bar D Chuckwagon in Durango, CO. This entry was posted in Backyard, Nature, Outdoors, Recipes and tagged Humor, Opossum, Recipe on December 8, 2014 by Melanie McNeil. I have a small garden plot next to the house where I raise tomatoes, pole beans, rhubarb, zinnias, peppers, and most important, basil. I let the basil get a little out of control and noticed it was flowering a lot. One sunny day, some winged visitors were there enjoying the basil flowers and the warm sun. I took a few pictures. I couldn’t identify them and later forgot about them. In browsing through those pictures, I came across this one from that day. At the time, my uneducated guess was that it was a Monarch or Viceroy. They can be confusing since they look a lot alike. I found two good pictures of the Monarch and Viceroy species. Can you see the difference in their markings. Notice the line across the rear part of the wings on the Viceroy. The creature in my photograph above is clearly not either. What is it? If you know, please comment below. Now for the tasty stuff. The reason we raise basil is, of course, to make pesto. What wonderful stuff. We tried several different versions of the recipe. Some ingredients were different in each. Finally, we settled on our own version that is simple and uses walnuts. If you want to try it yourself, try our recipe. I think you will be glad you did. We reach into the freezer any time and pull out frozen basil cups for all kinds of uses. One of our favorites is pesto pizza. What a treat! This entry was posted in Food, Nature and tagged Backyard Science, Basil, Butterfly, Cook, Gardening, Home, Olive oil, Pesto, Recipe on August 13, 2013 by Jim R.